In order to feel the city you need to walk through it. This walking tour starts with a visit to the Khan Shatyr shopping and entertainment center. We will then walk along the straight line named by Kisho Kurokawa, master of the general plan of Astana, known as the “Millennium Axis”. During the tour you will see new Astana Opera theater, and the Round Square with its cascade of fountains. While walking on Nurzhol and Green Water Boulevard you will observe all skyscrapers of Astana, which are astonishing with its non-standard forms. 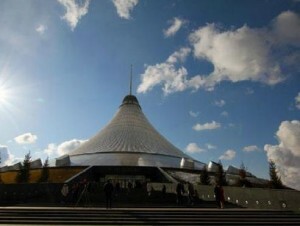 Your guide will take you further as you take the elevator to the top of the Astana-Baiterek monument to enjoy the grand panorama of Kazakhstan capital from the special observation deck, and then reach the final point of the tour – the Main Square, place, where all state authorities are concentrated.